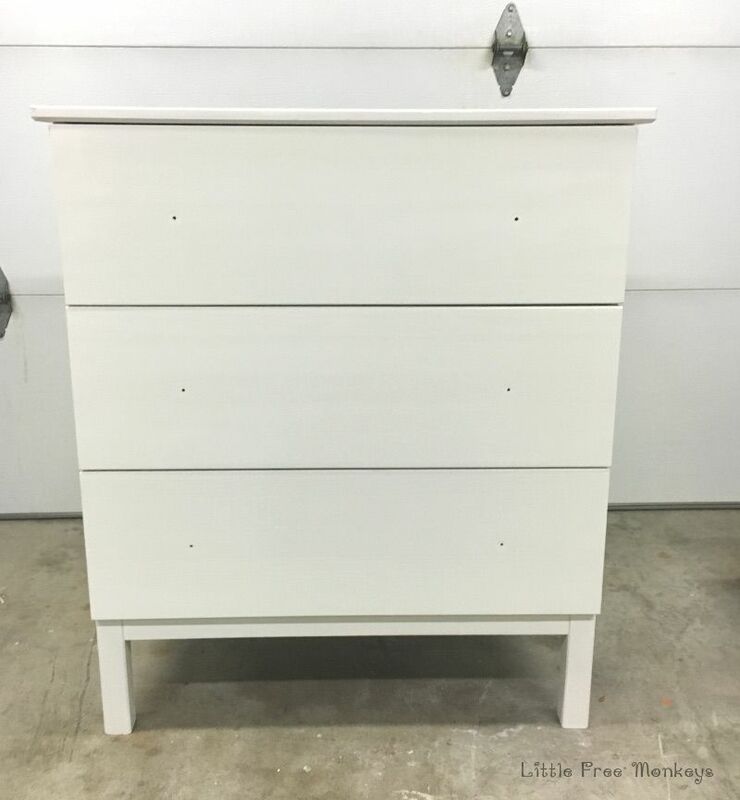 It’s so simple to give a basic and boring Ikea Tarva Dresser a good old makeover to give you kids room that “wow factor! 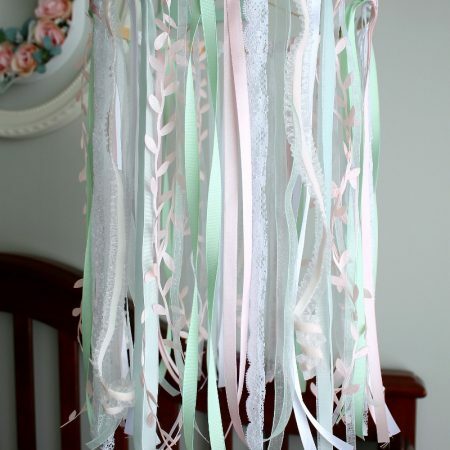 Hello Pastels and Macarons readers! I am Anika and I blog at Little Free Monkeys where I share fun DIY’s to create a home for my little kids (or monkeys as I call them lovingly). I am so excited to be sharing this fun Ikea Tarva dresser makeover I did for my kids room on Maria’s amazing blog today! I am a big fan of Maria’s creative inspirations and I am honored to be able to share my project with you all. My kids share a room and we are always looking for gender neutral decor. 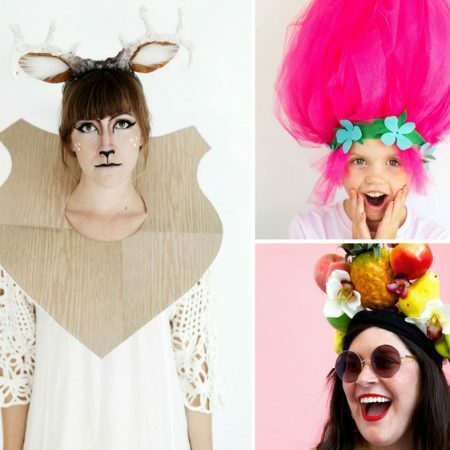 However, it is for the kids after all and I love to have a lot of fun and whimsy in there as well. Nothing is better than lots of fun colors! I built them a bedside table with book storage a little while ago which has been such a life saver to keep all the bedtime books organized. 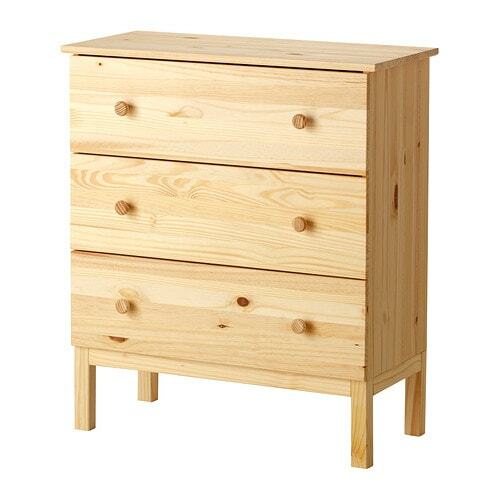 Next, we needed a dresser. I wanted clean simple lines and a little splash of color. I have built my fair share of furniture like this X-base nightstand but I opted for an Ikea Tarva dresser because, lets face it – why build a whole dresser when you can buy this simple dresser from Ikea. 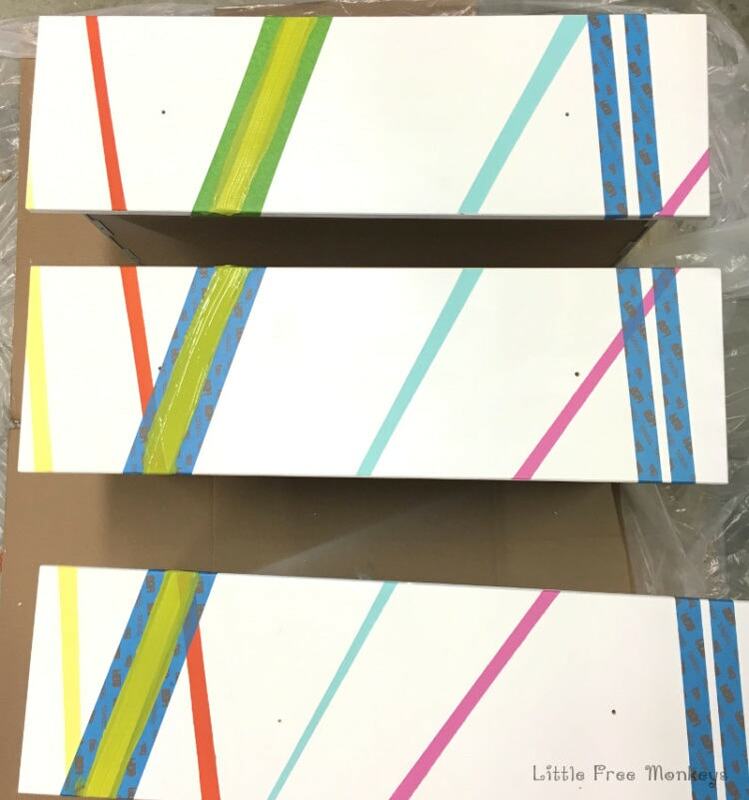 To go with the fun, whimsical and colorful theme we wanted for the room, I came up with this simple design that adds a ton of fun to the room! 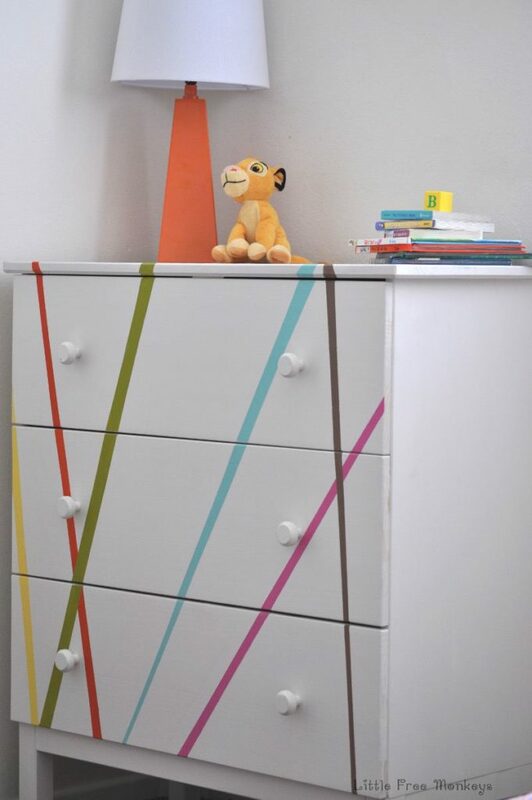 Just a little bit of paint turned it into a fun and whimsical dresser perfect for the kids room. Good quality bristle brush for the paints. Unfinished wood from Ikea is not perfectly smooth. A quick sand with the 180 grit sandpaper was all that was needed to get a smooth finish. In order to seal all the knots and keep them from bleeding through the paint, I gave applied a shellac based primer locally to the knots. Next I added 2 coats of an oil based primer followed by 3 coats of white paint. 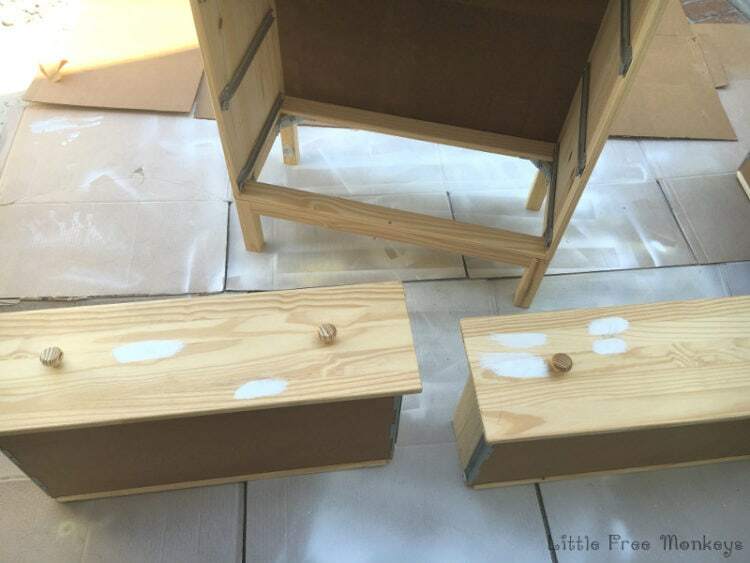 After waiting impatiently for the paint to dry, I put the drawers back on the dresser and marked lines where I wanted them using a yard stick. To add to the whimsy, I also wrapped a few lines on to the top as well. Then I took the drawers apart and taped off all the lines that I had marked. I painted all the colors I wanted along the taped lines. 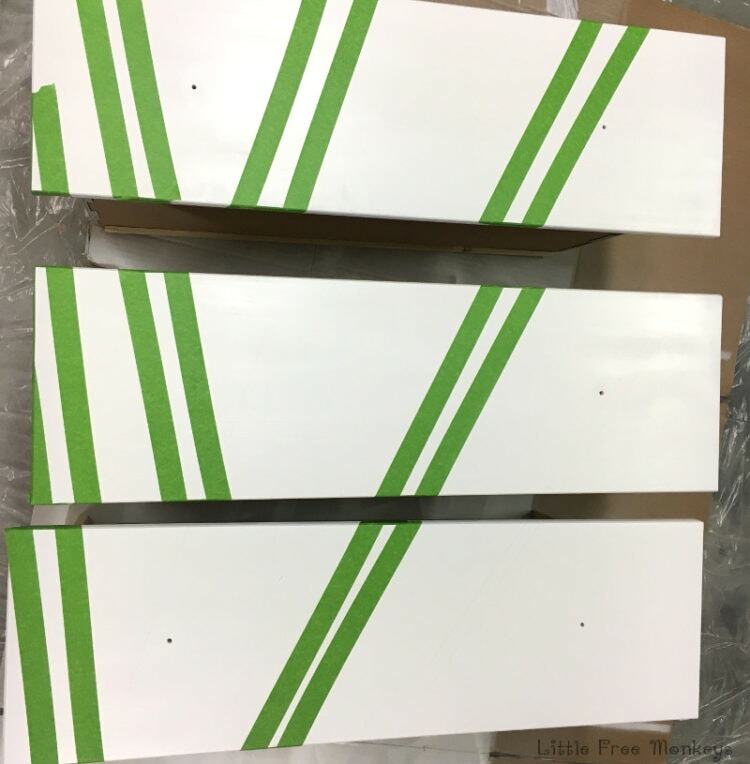 On some of the overlapping lines, I had to paint one color, wait for it to dry and then tape the other line and paint. For the knobs, I used the knobs that came with the dresser and painted them white. Thats it! 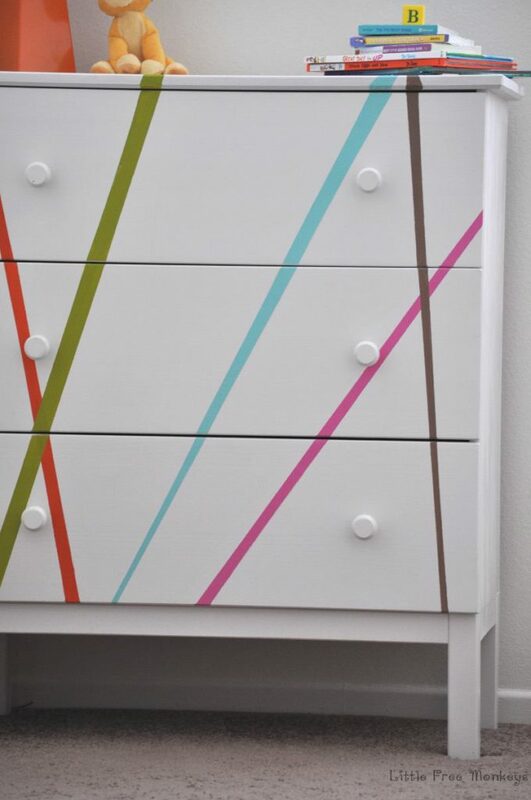 A super fun and colorful Ikea Tarva Dresser makeover! Want to see MORE Ikea Tarva Hacks? 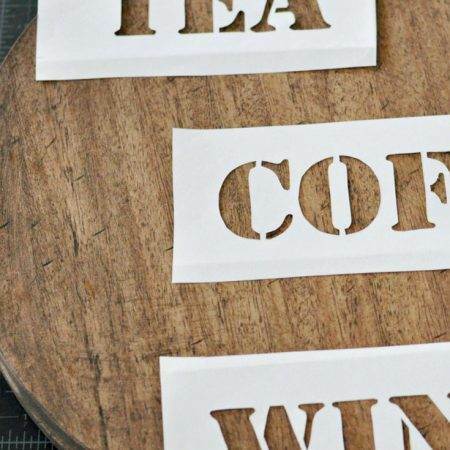 Check out these 15 Hacks using the Ikea Tarva! This is brilliant! 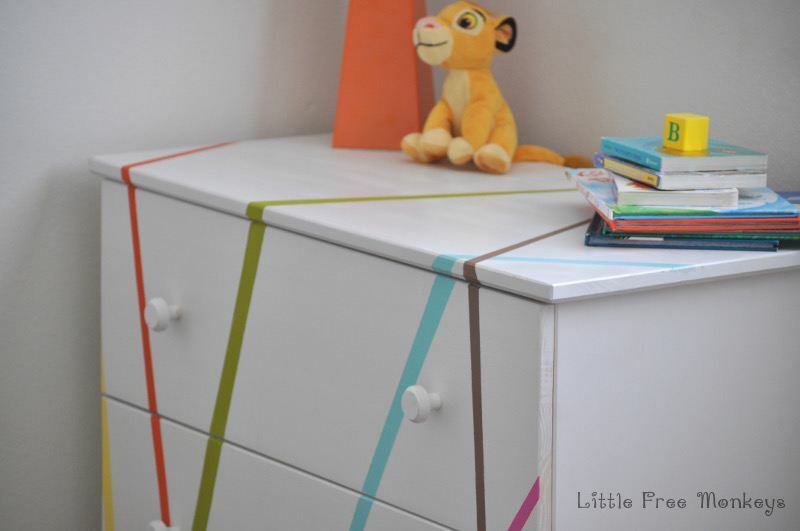 What a fun way to upgrade a basic dresser! Thanks Jen. Anika did an amazing job didn’t she?! I love this. 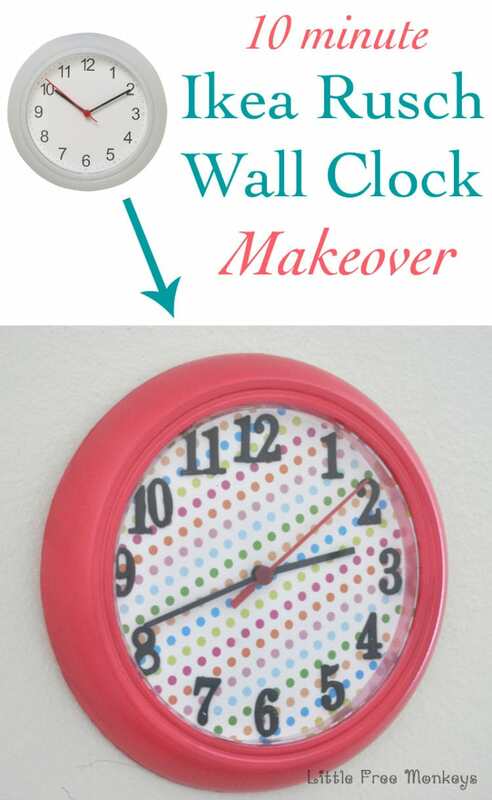 Such a great way to add a pop of color. Love this! 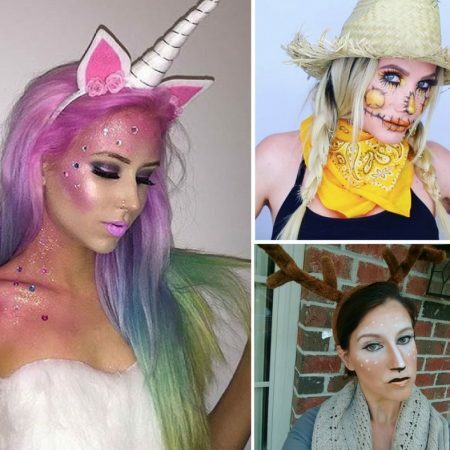 So easy to coordinate to any theme or colour scheme. Thanks for sharing! 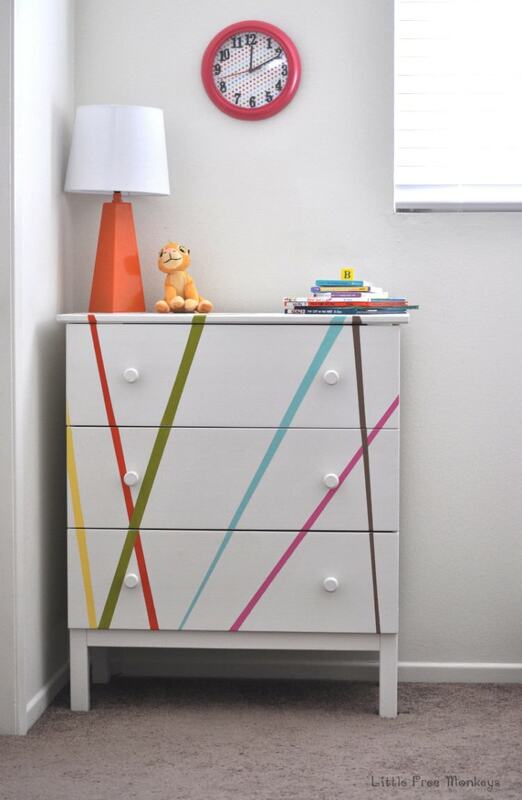 Oh, I love the update to this IKEA dresser – perfect for a kids room! This is ridiculously awesome! 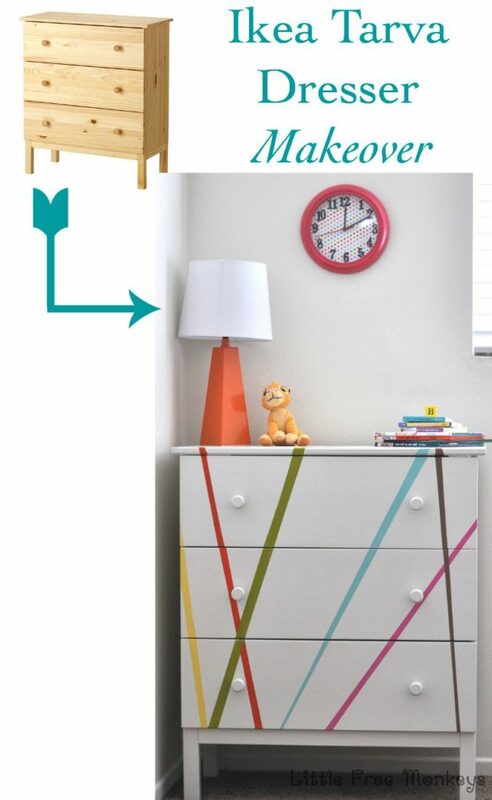 Love, love, loving the dresser makeover, too! What a great project, the dresser looks amazing. The power of paint strikes again!